There's been a pretty diverse team at Chilbolton working on the LOFAR installation, with staff and students from many different institutes and different origins. 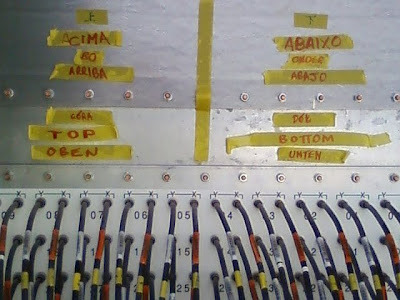 During the patching of the cables in the RF container, it became necessary to segregate the panel into two parts, according to whether the upper or lower ingress duct was to be used. A marker pen and some insulation tape were used to add some temporary labels. But for some reason, someone added a second set of labels on the panel in a different language. Then the idea had caught on and everyone who was there on the day added a language that they knew. By the end of the day a total of seven languages accumulated. Obviously the sixth line down is English, but do you recognise the others? Answers can be submitted by posting a comment.